Home » Events » Success in the sunshine at the May Day Fair! 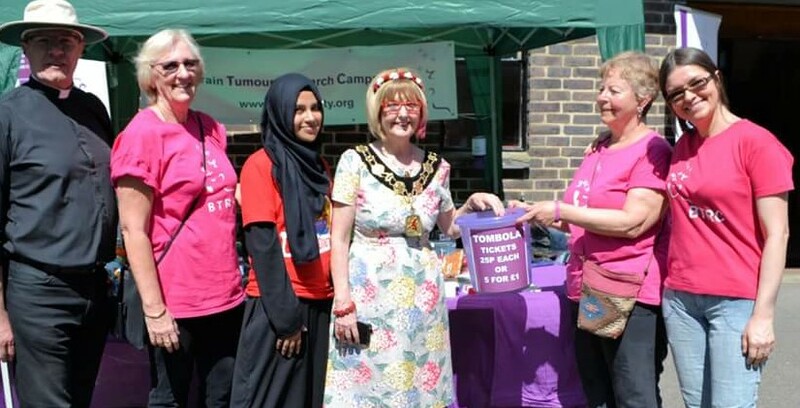 BTRC enjoyed a successful day in the bank holiday sunshine at Christ Church Southgate’s annual May Day Fair, taking in over £605 for the charity’s coffers. Primed with factor 30 suntan lotion, Wendy, Helen, Rosalie, Julia, Martha and Grace (our 4 legged supporter) sold over 3,500 tickets to the hoards of visitors, including the Mayor, who seemed happy to win a box of Betty’s Tea! Top chefs’ Brain Food event raises over £10K for BTRC! Nicola’s challenging Ride London race! Novice Triathlete Hannah finishes in under 3 hours!